Available from W.W. Norton & Company, Inc. 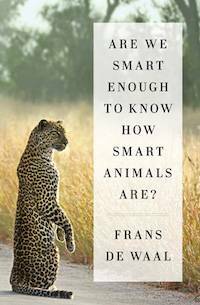 This important new book is the gold standard, at least for the general reader, for the emergent new way of looking at animal intelligence not in terms of how it compares to the human, but of how it serves the needs of the animals themselves. The clever title puts that perspective in front of us; one of the final sentences does the same: "Instead of making humanity the measure of all things, we need to evaluate other species by what they are." To take one of numerous examples in this volume, consider the Clark's nutcracker. There are those who base an assumption of the absolute superiority of humans over animals on our ability to speak, to count, even to do complex mathematical problems. This small avian, with his "bird brain," might fall short when it comes to words and numbers, yet in the fall stores more than twenty thousand pine nuts in hundreds of different places over many square miles, then in winter manages to recover the majority of them. How many of us could do that on the basis of memory alone? De Waal says he often can't even remember where he parked his car, and the same is true of me. Of course, increasingly we are understanding that even language use is not a clear cut-off between humans and animals, but an ability on a sliding scale. De Waal discusses Irene Pepperberg and her remarkable studies of her companion parrot Alex, reviewed earlier in The Peaceable Table, and several surveys of chimpanzee language. The overall approach is that of evolutionary cognition, that is, the view that mind and its various attributes have emerged in all species according to their needs -- including needs for love, joy, and play as well as physical gratification -- over the long course of evolution. They may be at different places in that parade, but those standings must be judged in light of the animal's own Umwelt, world situation or worldview, as it is sometimes here called. The intelligence of whales and dolphins may approach the human, but because their Umwelt and bodily shape are entirely different from ours, their creativity is expressed not in making tools, from choppers to computers, or even in counting (in units of tens) as on fingers, but perhaps in their complex songs. De Waal mentions tells us that each individual cetacean seems to have a personal tone or "signature" distinct from that of others. Those remarkable melodies vary over time and place, are carried over thousands of miles from one pod to another, and for all we know may articulate remarkable romantic or philosophical themes utterly inaccessible to us in our own limited Umwelt. De Waal quotes the philosopher Ludwig Wittgenstein as saying, "If a lion could talk, we could not understand him." The author demurs a bit at this caveat, but I believe, as de Waal does too, that it is true in a significant sense because of the highly different world of experience out of which that communication would come. And if it is true of lions, I don't doubt it would be exponentially more true of whale songs and the Umwelt behind them. Thus it is sometimes difficult, indeed virtually impossible, for us humans fully to get inside of the world of another species, one probably as complex, and as valid, as ours, but different. We experience the world primarily visually, sight being our major sense, then sound. We can try, but can we really understand empathically the worldview of a bat, she or he knowing the same planet as us but through radar-like ultrasonic beams rather than "ordinary" light or sound waves; or a deep sea creatures living where sunlight never penetrates? Or of an ant, who experiences the world mostly through taste and touch, including articulate messages transmitted through touching feelers, rather than sight and sound, and virtually like a cell in the body of a vast community? Of a whale, whose books are songs? Examples like these, and much, much more, are presented in Are We Smart Enough to Know How Smart Animals Are? They are fruits of the science de Waal and others call ethology, study of animal behavior under natural conditions. According to this author, ethology and the complementary attitude of evolutionary cognition are the coming thing among younger students, and a good thing that is not only for human understanding of animals, but for animals themselves--for it can only lead to greater respect for what they are in themselves. Then we can hope for better treatment of theirs by our particular species. De Waal makes clear his view, with which the reader today is likely to sympathize, of the severe limitations of early- and middle-twentieth-century scholars, influenced by behaviorist psychology, who saw animal mentality mostly in terms of stimulus-response and very short memory, and dogmatically ruled out even the use of terms like “animal cognition.” Although they saw themselves as very scientific, these savants seemed to reflect an earlier theological point of view emphasizing the immense gulf between humans, with incomparable rational mind and eternal soul, and the temporal beasts of the earth put there to serve the higher caste. This insistence on the gulf isn’t limited to the scientifically oriented. De Waal cites an amusing example of it from the person-on-the-street in a story told him by Desmond Morris. Because chimpanzees are good with tools, a colony confined in a London zoo had no difficulty in performing a tea party for the public: pouring out tea from a pot into cups and sitting around a table drinking it, as well as eating food from bowls with spoons. But human visitors became uneasy when their performance became too polished; high tea is considered the apex of civilization in Britain, comments de Waal, and chimps ought not to approach this peak of human culture. So the apes had to be taught to drink the tea from the spout, throw food about, and spill the tea. The public was delighted with this proof of their own, uniquely human, superiority. To be sure, some thinkers from the philosopher David Hume to the great biologist Charles Darwin anticipated evolutionary cognition by propounding that consciousness, however one define it, or intelligence, is a matter of scale rather than of absolute differences between any species. In all genera, including our own, they said, mind developed naturally so far as evolution is concerned and in terms of the Umwelt and role of that animal, whatever its ultimate metaphysical ground of being. That view is on the rise again, and here is an enthralling book full of wonderful animal accounts to make it sing. Are We Smart Enough to Know How Smart Animals Are? is highly recommended for all personal and institutional libraries. You'll find it hard to put down. Franciscus Bernardus Maria "Frans" de Waal, PhD is a Dutch primatologist and ethologist. He is the Charles Howard Candler professor of Primate Behavior in the Emory University psychology department in Atlanta, Georgia, and director of the Living Links Center at the Yerkes National Primate Research Center and author of numerous books including Chimpanzee Politics and Our Inner Ape. His research centers on primate social behavior, including conflict resolution, cooperation, inequity aversion, and food-sharing. He is a Member of the United States National Academy of Sciences and the Royal Netherlands Academy of Arts and Sciences.